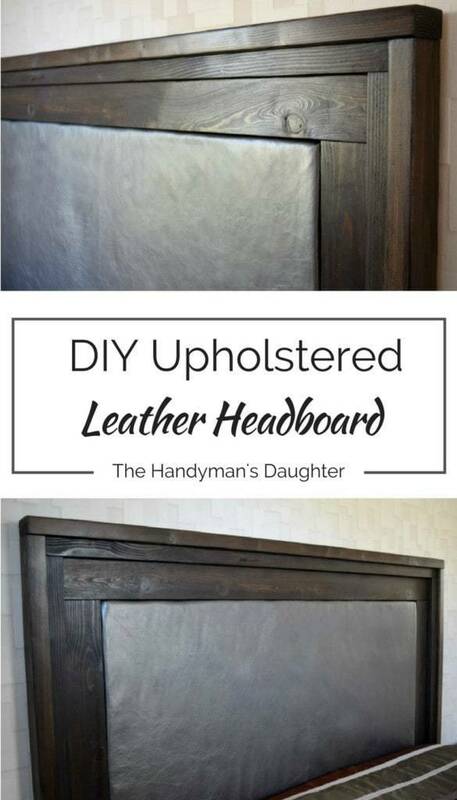 Create your own luxurious DIY leather headboard with stacked wood trim! 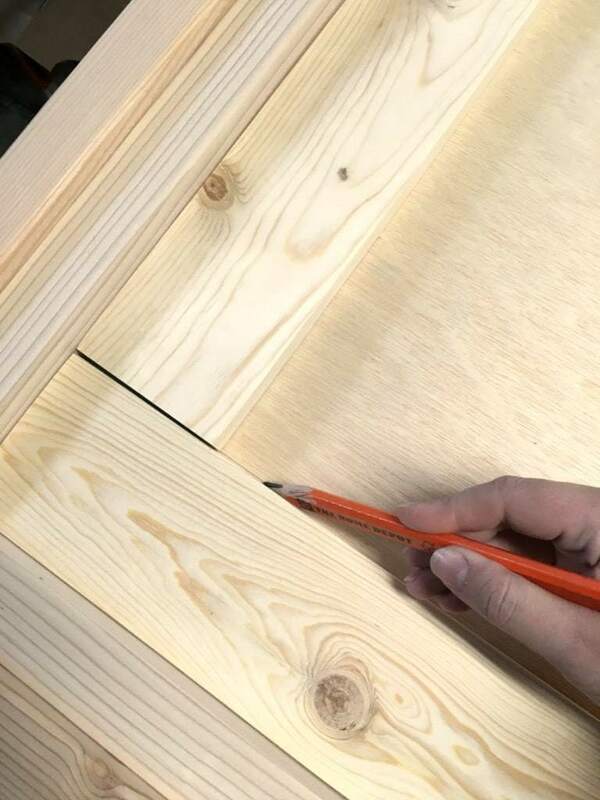 This easy tutorial will show you how to make it yourself with standard lumber. Get the free woodworking plans and start building! After completing the textured wallpaper accent wall in our master bedroom a few weeks ago, we desperately needed a headboard to protect it. 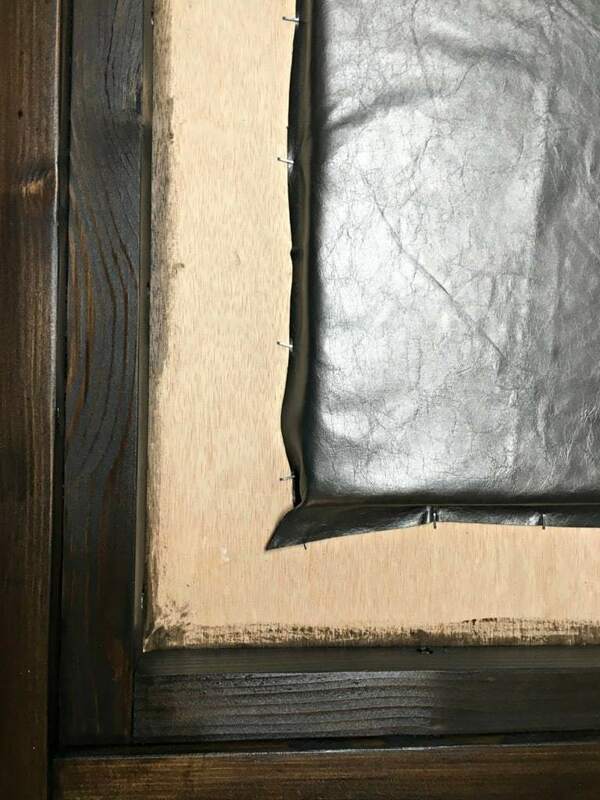 Luckily, the good people at Leather Hide Store approached me with the offer of a scrumptious piece of leather to use in one of my DIY projects. The timing could not have been more perfect. A gorgeous upholstered leather headboard is just what we need for our master bedroom makeover! Disclosure: I was provided with the leather for this project by Leather Hide Store, but all opinions are 100% my own. This post contains affiliate links for your convenience. For more information, please see my disclosures page. It was so hard to choose from their amazing selection of upholstery leather! I requested a bunch of samples to narrow it down. I was immediately drawn to the silver metallic leather, which is more of a pewter color. It’s neutral enough to go with any color scheme, but the metallic sheen gives it a little bling! Leather Hide Store has a wide variety of affordable leather remnants, which are photographed individually with a square foot grid so you know exactly what you’re getting. I was looking for a piece that was at least four feet by two feet, and this one was perfect! 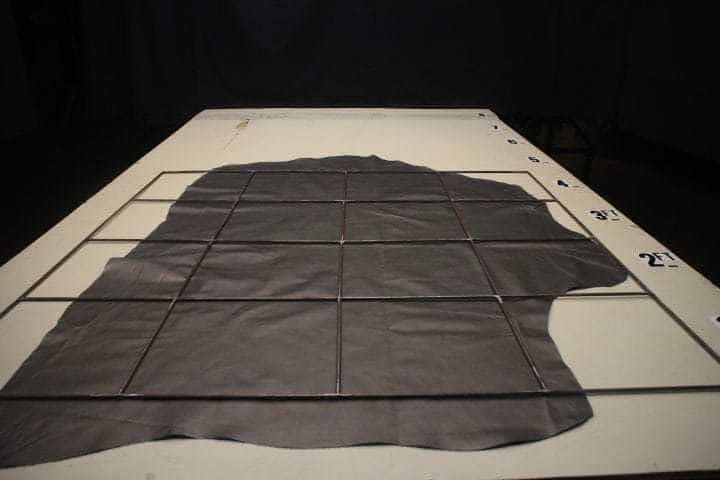 When my leather arrived in the mail, I couldn’t wait to get it on my cutting table. I measured out a few different rectangles to determine the best use of the entire piece, marking out the shapes with a chalk wheel on the back of the leather. After taking a deep breath, I cut out a 54″ x 27″ rectangle. With the leather cut, I could now use those dimensions to design the frame of the headboard. I wanted to mimic the effect of the textured wallpaper I recently installed, so I put together a stacked wood frame with staggered corners. Here’s what you’ll need to create your own! 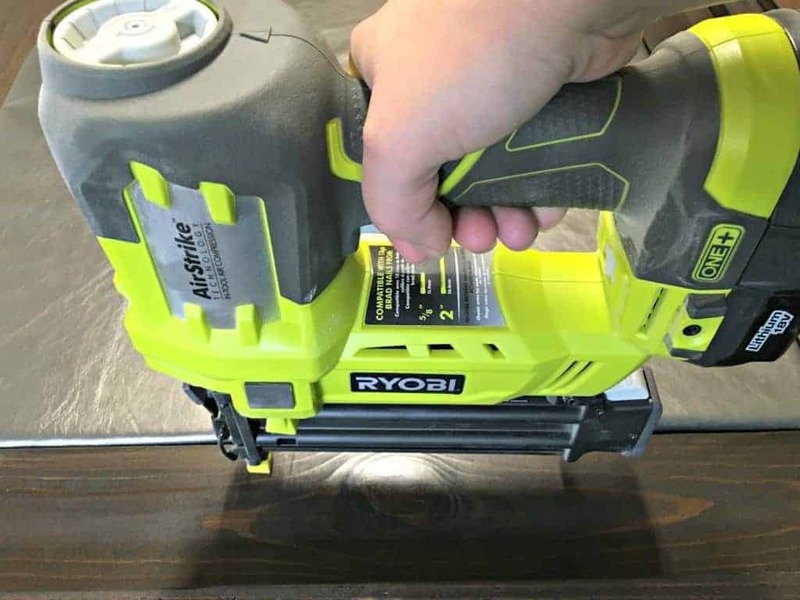 I highly recommend getting a Ryobi Airstrike brad nailer for this project and so many others. You can find factory reconditioned ones on Amazon at a discounted price. Make sure all your boards are sanded down before assembly. I started with 80 grit sandpaper, then 150, and finished with 220 for a super smooth surface. Start with the 2 x 2 boards. Decide which sides you want to face outward, and drill pocket holes into one end of each of the short pieces on the back side. 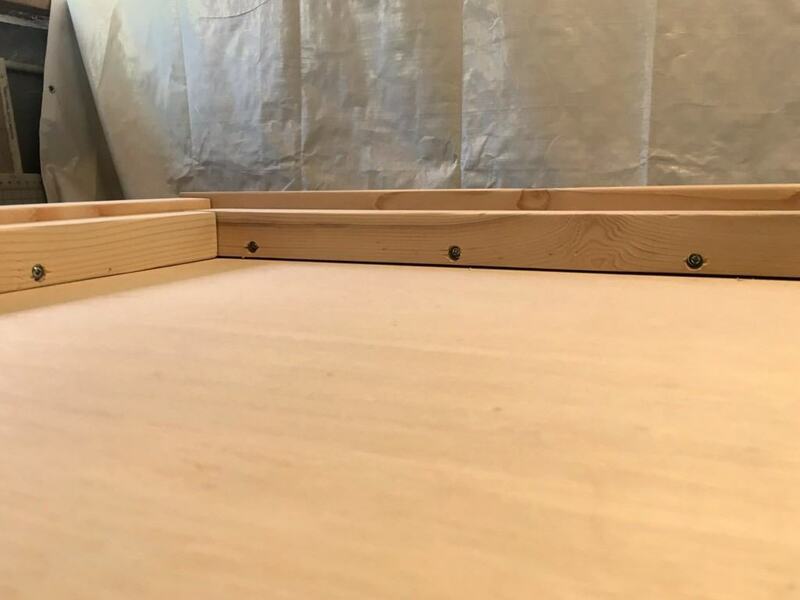 Place those boards, pocket hole side down, next to each other on the worktable. Now mark along the length every 8-10 inches at the bottom of the sides facing each other. Drill pocket holes at those marks. Your short 2 x 2s should end up looking like this. Repeat the pocket holes along the side of the longer 2 x 2, then assemble those pieces into a U shape. The pocket holes along the sides should be facing inward. Place your 2 x 2 U shape on top of the edges of the plywood. It should fit perfectly along the edge. Next, set the 2 x 3 boards around the edge of the plywood, on the worktable. 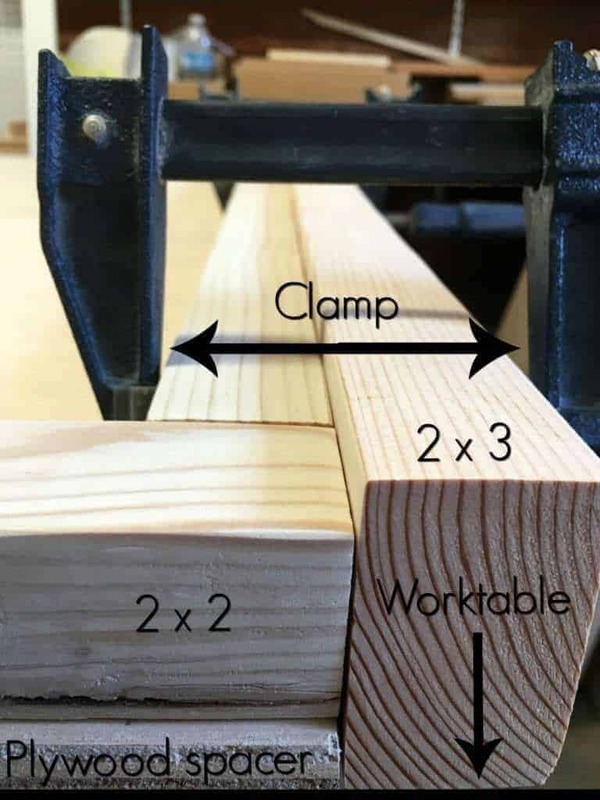 Clamp the 2 x 2s and 2 x 3s together. The plywood is just being used as a spacer right now, and doesn’t need to be clamped. A picture is worth a thousand words, so hopefully this will help! Using 2 1/2″ pocket hole screws, attach the 2 x 2 U shape to the 2 x 3s. Remove the newly formed double U from the plywood. 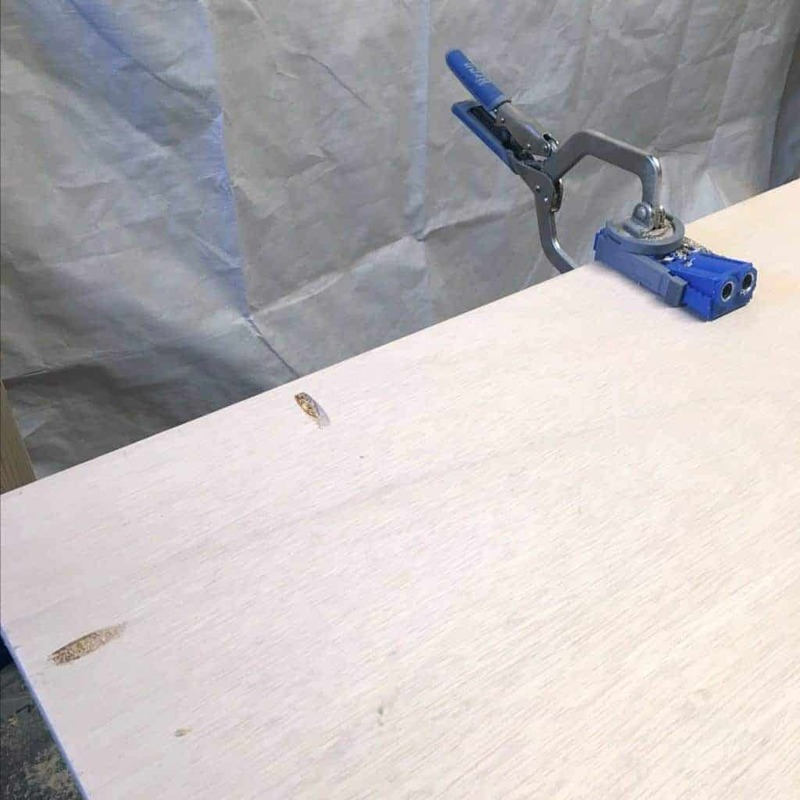 Drill pocket holes in the plywood every 8-10 inches along three sides, towards the outside edge. Lay your double U frame upside down on a flat surface, and fit the plywood into the back. 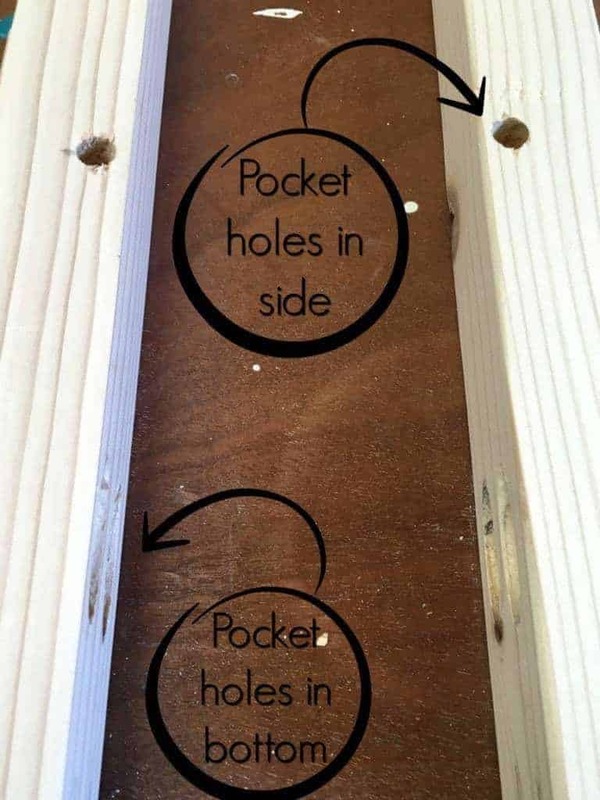 Clamp the plywood in place, then screw in 1″ pocket hole screws. 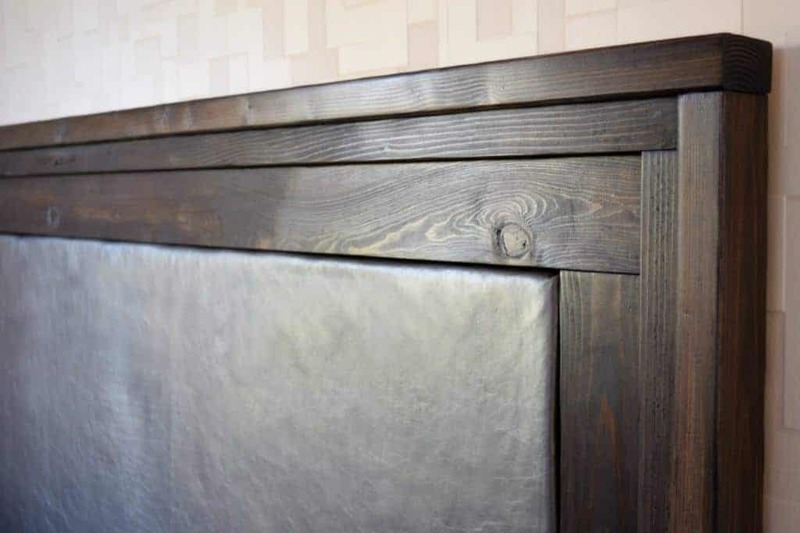 Flip the entire headboard over, and place your 1 x 4 pieces on the inside of the frame. Mark the inner edge of the 1 x 4s on the plywood with a pencil. These marks will indicate where to put your foam later on. Remember that long, skinny piece of plywood that was left over when you had the headboard back cut out? 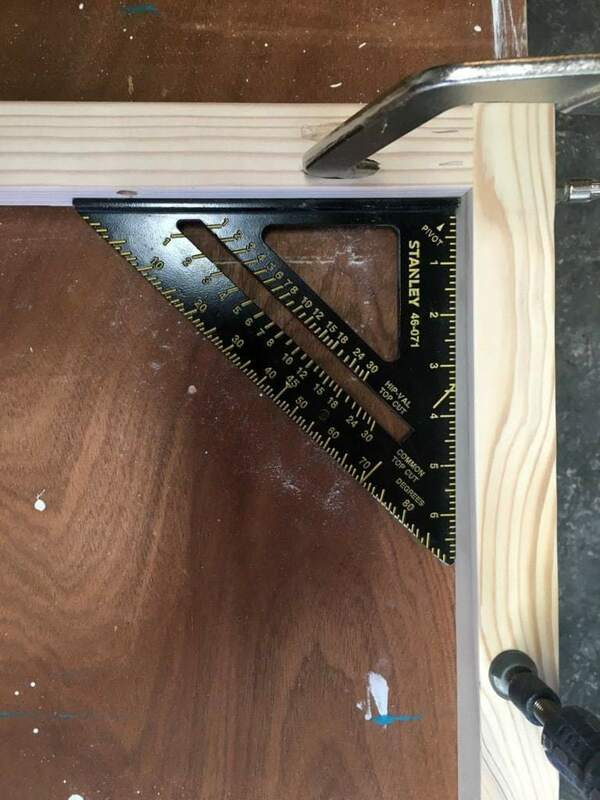 With the 1 x 4’s in place, measure the distance between the two short pieces and cut the plywood to fit. This piece will be behind the mattress and won’t be seen. It will help support the foam and protect your mattress from the staples. If you are planning on painting or staining your headboard, now would be a good time to do it. Remove the 1 x 4’s and the plywood strip, and stain those separately. Don’t bother with the plywood backing because it will be covered up. I used Varathane’s Stain + Poly in Kona. Once everything is dry, you can finally attach the leather! 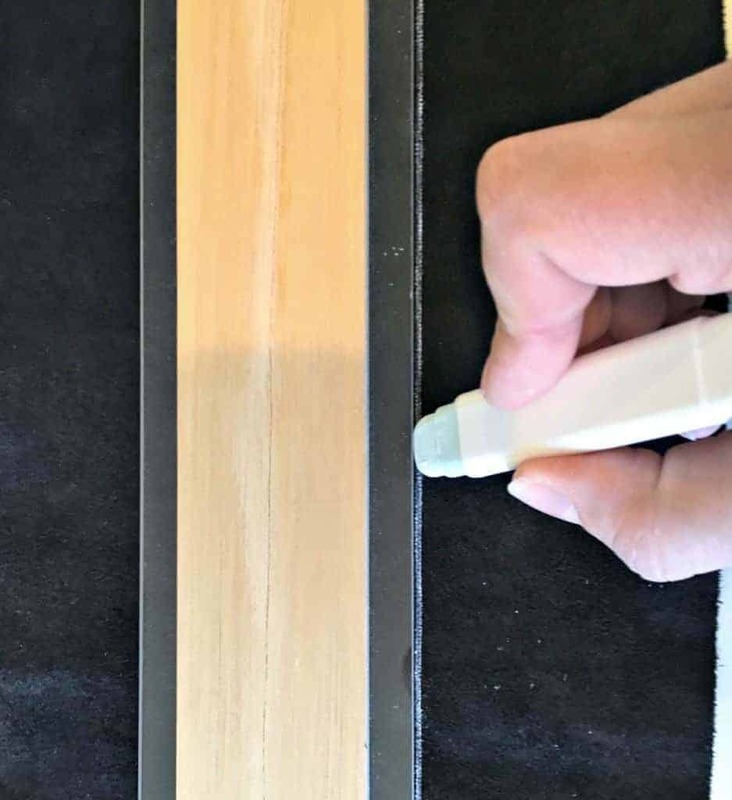 Spray the back of the foam padding with the spray adhesive and place it along your pencil markings. You may also want to add some batting to give it a bit more cushion and fill out some wrinkles in the leather. Drape the leather over the foam, making sure it overlaps evenly on all sides. Staple the leather to the plywood backing as close to the foam as you can get. If the staples won’t sit flush with the surface of the plywood, use a hammer to flatten them. Fit the 1 x 4 boards between the frame and the leather. The boards should cover up the edges of the leather and the staples. 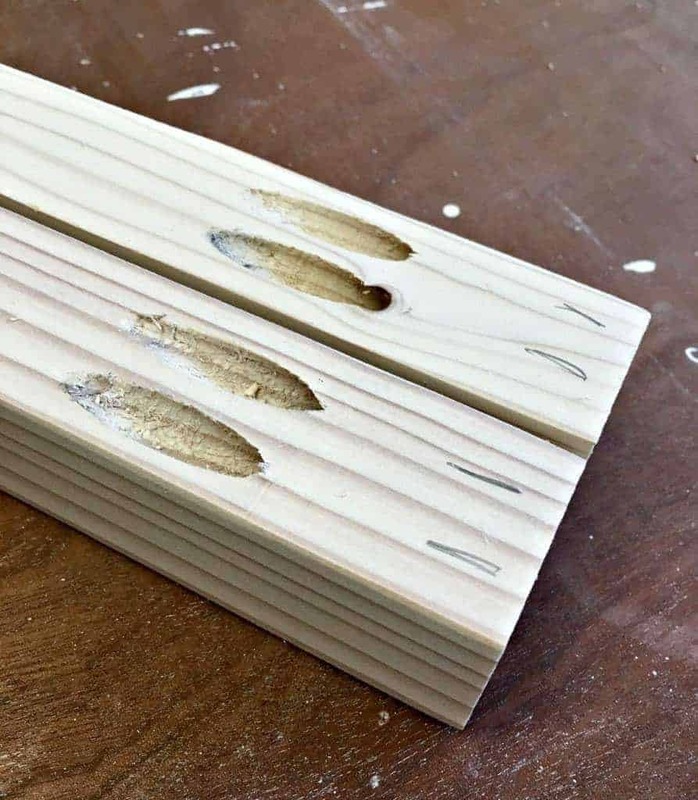 Attach the 1 x 4’s to the plywood with 1″ nails. 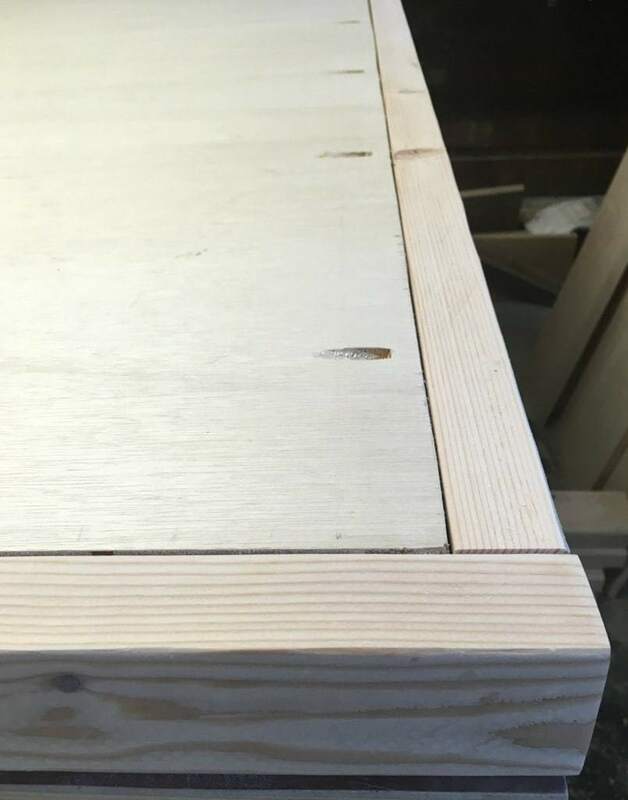 Use the long strip of plywood to cover up the bottom edge. I used my Ryobi Airstrike brad nailer for this step. After nailing the final boards in place, dab a bit of your wood stain into the nail holes. Wipe away the excess on the surface of the boards with a paper towel. 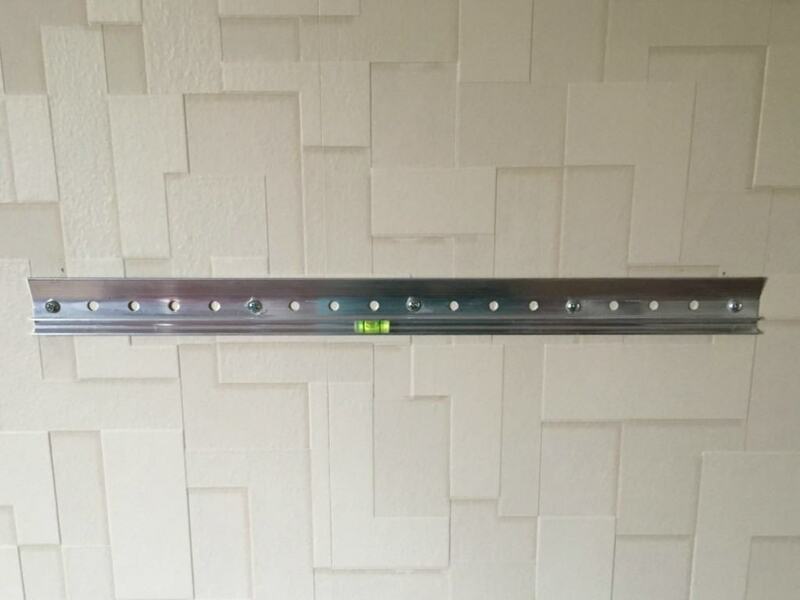 Figure out where you want to attach your headboard to the wall, and mark the center. Keep in mind that the plywood at the bottom should rest behind the mattress, so measure the height of your bed! Attach one side of the French cleat to the wall, making sure to hit at least one stud. Attach the other side of the cleat to the back of the headboard, then just hook the two sides of the cleat together! This is my first custom designed woodworking piece, and I’m quite proud of how it turned out! The leather really pops against the dark trim, and I love the stacked effect of the wood against the three-dimensional wallpaper. Looking to reupholster an existing furniture piece, but don’t know how much fabric or leather you’ll need for the job? Leather Hide Store has a handy printable guide to help you figure it out! 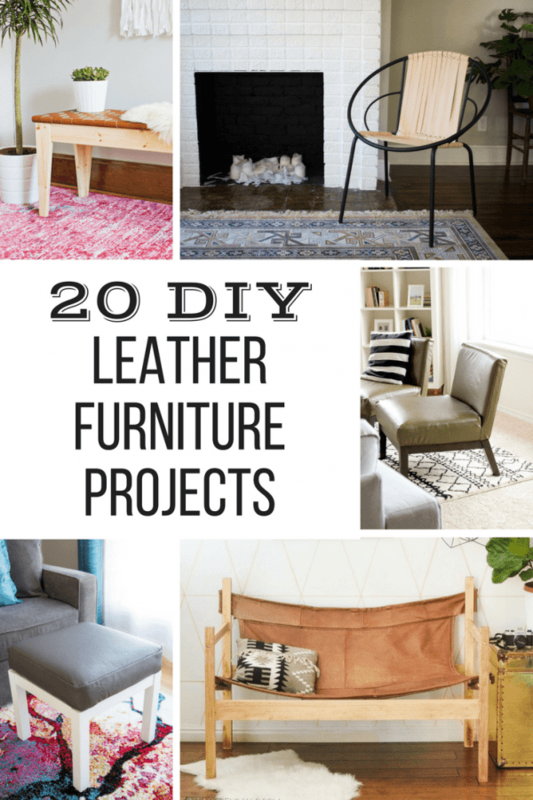 Want more DIY leather project ideas? I’ve put together a list that’s sure to inspire you to make something today! Wow Vineta that is so beautiful! I love that you designed it to mimic that lovely wallpape. Great job, I can’t wait to see what you design next! 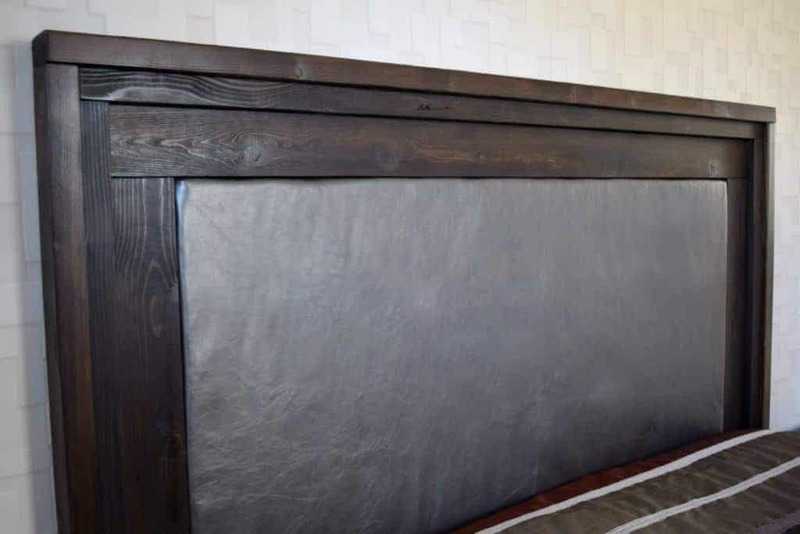 I am in love with the clean lines of this headboard! Beautiful! Thanks Leanne! I had debated making a much more complicated pattern, but I’m glad I stuck with the clean lines! This is beautiful! Love the mix of wood and leather. And their Shagreen Copper Leather is gorgeous! I agree! Shagreen Copper is one of my favorites too. I’ll have to come up with another project using that one in the future! This is so beautiful Vineta! Thank you so much for using our leather. I love the dark stain combined with the metallic leather, just gorgeous! I really like the MO#1 MONTANA BUCKSKIN! I am so impressed! This is just gorgeous and what great way to incorporate leather into your decor. Always a classic. I like the NT#4 GREAT SMOKY MOUNTAIN in the Naturals line! I have the frame for a camel saddle I’ve been wanting to figure out how to make a new cushion for – any of their remnents would be a great choice for that project. Wow, a camel saddle? How cool! I just love that combo of the dark wood and your “color” choice of leather, very cool! Thank you for sharing with us at the To grandma’s house we go link party! Pinned! That sea mist color is gorgeous! I love your headboard too! Wow, what an amazing project. You did a great job! Congrats, your headboard is beautiful! I love their 1k460 Red Clay leather. I have been wanting to do a padded headboard for ages but couldn’t find the right color fabric. The red clay would be perfect for me. I have 4 dogs and live out in the country, they are always tracking in the red clay from outside and yes, I let them get on the bed. That means I have to wash my king sized comforter at least once a week at the laundry mat, it won’t fit in my machine. So I have decided to redo my bedroom. After I finish the project I am currently working on, I am definitely going to make this headboard!! This is great!! And such a nice different look from the usual DIY headboards. Love it! Hi Vineta… What perfect timing for me to find your site and this particular post! My daughter wants an updated headboard for her bed and is looking for something that’s not that ‘girly’ but more modern. She just loves the look. And it’ll be a nice project to build with her. Thanks for sharing! I’m so glad I could help! This would be a great project to build with your daughter! I like the simply beige and the mint whisper.